When my husband is out of town for work, we add things to our dinner that he would not dare touch. Things like mushrooms. I don't understand mushroom haters at all. To me, they enhance a dish with their mellow flavor and tender texture. To him, they make things taste too earthy. Lasagna just keeps getting easier to make. Take a close look at this picture. The bottom noodle layer is just one square sheet, and it only requires a light soaking in warm water before adding to the baking pan. How convenient. No boiling, no need to layer side by side. Talk about easy! As always, when you don't need a huge, long, rectangular pan of lasagna, you can make a square dish that typically feeds a small family of four. This dish is cut into 9 squares, enough to serve everybody seconds, and even another person, thirds. 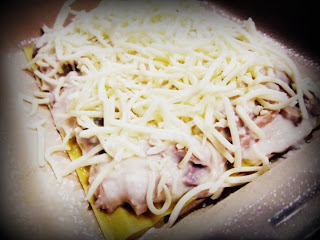 If you missed my previous lasagna posts, you can check out my No - Ricotta Italian Sausage Lasagna or my Seafood Lasagna. Bring a medium stock pot of water up to a boil. Add chicken, reduce heat to medium low, then simmer with lid on about 40 minutes or until done. Remove chicken from pot and let cool on a cutting board. Shred meat with 2 forks, discarding fat. Preheat oven to 320 degrees. Make sauce: Add flour to a large sauce pan over medium high heat. Toast slowly. When warmed well, remove from heat. Add butter, whisking to combine. Return to heat over medium. Add milk, slowly, a little at a time, whisking to combine. When all the milk is incorporated, continue to cook over medium low heat until slightly thickened. Add the asiago cheese, mixing well. 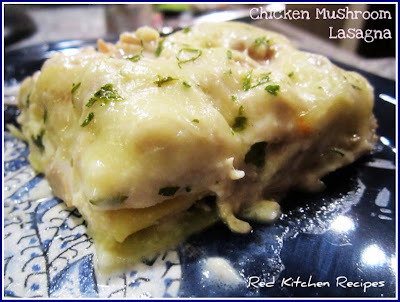 Add the chicken and mushrooms to the cheese sauce mixture. 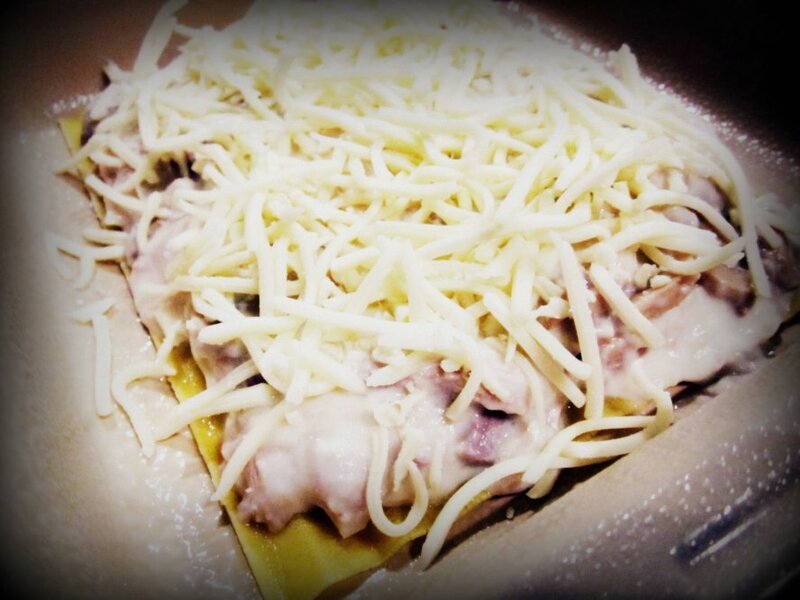 Soak a sheet of lasagna. Spray a square pan with canola spray, then lay the sheet on top. Add the cheese sauce and chicken mixture, spreading as thinly or thickly as you'd like. Top with some mozzarella cheese. Optional: top with chopped parsley if you'd like a little more color. You can continue with one more or two more layers, depending on how thinly you spread each layer. Even though the sheets don't touch the sides of the pan, you'll still be able to easily cut squares out of the finished lasagna. Cover with foil, and bake 25 - 35 minutes, uncovering the foil after the last 10 minutes.